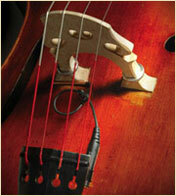 We currently offer upright double bass pickups by David Gage, Fishman and K&K Sound and Underwood. For our pickups, we offer free shipping to any USA delivery. (Shipping to Alaska, Hawaii and Puerto Rico are slightly more). 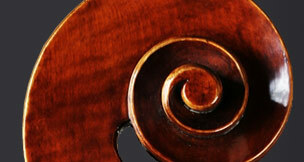 For more detailed information about bass pickups please click photos. 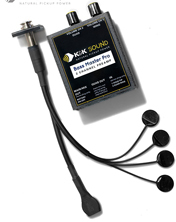 This is the new 'Lifeline' bass pickup that fits between the bass adjuster and bridge foot. 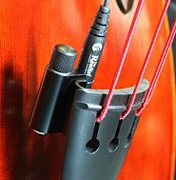 Gage Lifeline Upright Bass Pickup page. Free Shipping on all pickups. 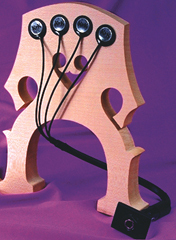 This upright bass pickup is the most popular upright bass pickup. 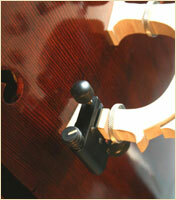 It is easy to install and slides directly underneath the E string side of the bridge foot. 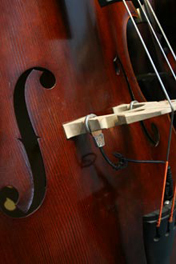 For more information and detailed explanations of this pickup, see our Realist Upright Bass Pickup page. Same pickup model as above, yet this one uses the wood panel shim instead of the copper sheet as the pickup above. 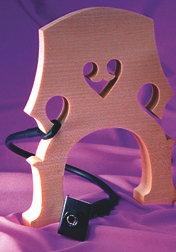 Fits on the bass' tailpiece and will work on any pickup. A lot of pickups do not come with Volume knob and it can be a hassle to go over to the amp. With the Docking Station, you have quick and easy access. 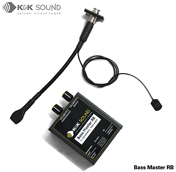 This new pickup is great in that it does not mark the bass in any way and can be easily mounted in different areas of the bridge for a different sound. Also easily mounts on and off. 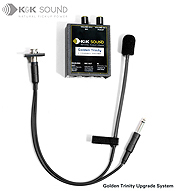 For more information and detailed explanations of this pickup, see our Realist Soundclip page. This pickup is built into the aluminum bridge adjuster. Click on the photo to the left too see a close up of the actual pickup. A very popular pickup! 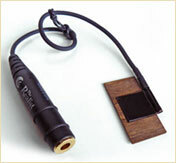 The Full Circles come with the adjuster diameter thread: 1/4" (most common), 5/16-18, and 6x1mm. For more information and detailed explanations of this pickup, see our Fishman Full Circle Pickup page. This one has been around for a while, but still, another reliable favorite with customers. For more information and detailed explanations of this pickup, see our Fishman BP-100 Pickup page. 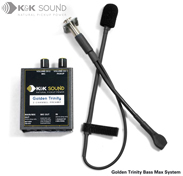 For more information and detailed explanations of this pickup, see our K&K Bass Max page. For more information and detailed explanations of this pickup, see our K&K Double Big Twin page. For more information and detailed explanations of this pickup, see our K&K Bass Fingerboard pickup page. For more information and detailed explanations of this pickup, see our K&K Rockabilly pickup page. For more information and detailed explanations of this pickup, see our K&K Bass Master Pro page. For more information and detailed explanations of this pickup, see our K&K Golden Trinity pickup page. 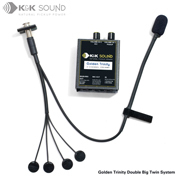 K&K Golden Trinity Upgrade System.